Shortly before his death in 2004, Jacques Derrida expressed two paradoxical convictions: he was certain that he would be forgotten the very day he died, yet at the same time certain that something of his work would survive in the cultural memory. This text by Peter Sloterdijk – one of the major figures of contemporary philosophy – makes a contribution of its own to the preservation and continuation of Derrida’s unique and powerful work. In this brief but illuminating text, Sloterdijk offers a series of recontextualizations of Derrida’s work by exploring the connections between Derrida and seven major thinkers, including Hegel, Freud and Thomas Mann. 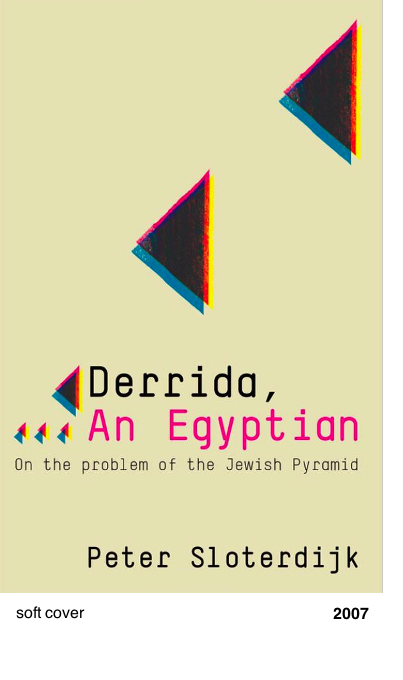 The leitmotif of this exploration is the role that Egypt and the Egyptian pyramid plays in the philosophical imagination of the West, from the exodus of Moses and the Jews to the conceptualization of the pyramid as the archetype of the cumbersome objects that cannot be taken along by the spirit on its return to itself. ‚Egyptian‘ is the term for all constructs that can be subjected to deconstruction – except for the pyramind, that most Egyptian of edifices, which stands in its place, unshakeable for all time, because its form is the undeconstructible remainder of a construction that is built to look as it would after its own collapse.